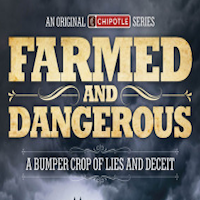 “Farmed and Dangerous” is the name of Chipotle’s new television show, set to air on Hulu and Hulu Plus next month. It’s being described as a Chipotle original comedy series that satirically explores the world of industrial agriculture in America. In the first four-episode season, actor Ray Wise (“Twin Peaks,” “Mad Men,” “24”) plays Buck Marshall, a marketer with the Industrial Food Image Bureau (IFIB). Marshall is tasked with releasing a new petroleum-based animal feed that may “forever reshape industrial agriculture.” When a security video of the product is leaked, Marshall goes into high gear to save the reputation of the new product. The satirical plot line mirrors the lengths to which corporate agribusiness and its image-makers will go to create a positive image of industrial agriculture. Chipotle and partner Piro, a studio based out of New York, promise that the show will not be filled with obvious references to the Chipotle brand. The initial four-episode season will be presented weekly beginning on February 17.